There’s no certainty yet about the identity of four gunmen who early Sunday stormed an Indian army installation in Uri, Kashmir with guns & grenades. They killed 17 soldiers, injured several others, & were themselves killed in the shootout. Whether the gunmen turn out to be Pakistani operatives, suicide bombers, Kashmiri guerrillas, the Indian government will use it to increase military terrorism in Kashmir against unarmed protesters who had nothing to do with the incident. 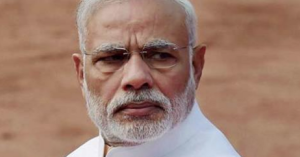 If they’re looking for condemnations, for someone to blame, for who is ultimately responsible for the deaths of those soldiers & the grief of their families, they need look no further than Indian prime minister Narendra Modi who deploys 700,000 soldiers in Kashmir, has engaged in an over ten week assault on unarmed protesters using pellet guns, tear gas & sound grenades, live ammunition, & has unleashed drunken soldiers in orchestrated night raids, home invasions, beatings where many have been injured & some killed. The AFL-CIO, one of the two labor federations in the fractured US trade union movement, just announced its support for the Dakota Access oil pipeline project being opposed massively & vigorously by the Standing Rock Sioux Tribe in North Dakota & by environmentalists. 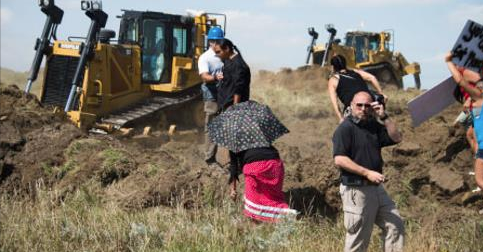 The Standing Rock nation opposes the project because it violates their sovereignty, expropriates their lands, imperils their water supply, & tramples & destroys sacred grounds. These are the same neoliberal capitalist policies being carried out & actively opposed by indigenous peoples on every continent. Their struggles have put them on the front lines against the environmental destruction leading to climate change. The AFL-CIO says it endorses the project because it makes the US more competitive & provides high-paying jobs to workers in the construction trades. Union officials are responding to pressure from racist, xenophobic unions who prioritize their privileges & union scale wages (even on dangerous jobs) over the rights of Native Americans. The AFL-CIO is in a conundrum of its own creation, of decades of racist policies against undocumented immigrant workers, Black, Latino, & women workers. In place of solidarity, it rendered social divisions & support for US wars. Don’t ask the women & Black workers–who through affirmative action in the 1970s finally got access to high-paying, formerly all-white male construction & factory jobs–to feel sorry for these mostly white guys who will have to look for other work. When it came to layoffs in the 1980s & 1990s, we were the first to go & many had to settle again for minimum wage jobs. If high-paid union workers want to solve their employment problems, it shouldn’t be on the backs of women & Black workers or of Native American sovereignty. They need to occupy the AFL-CIO union offices & regain control of the union movement in the interests of all workers, not just their own white male asses. As the 15th anniversary of the US-NATO war approaches in October, we are facing a long virtual news blackout. The only coverage is of suicide bombings in Kabul without media offering any real explanations of what those are all about. You don’t have to be a libertarian conspiracy theorist to suspect agents provocateurs to justify continuing US occupation & bombing. Meanwhile, there is a campaign by the Pakistani government & rightwing politicians to expel the nearly 3 million Afghan refugees from the war. 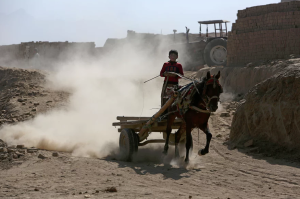 The UN refugee agency has been complicit in that campaign trying to induce Afghans with chump change to move back to a war zone with no housing, jobs, security. 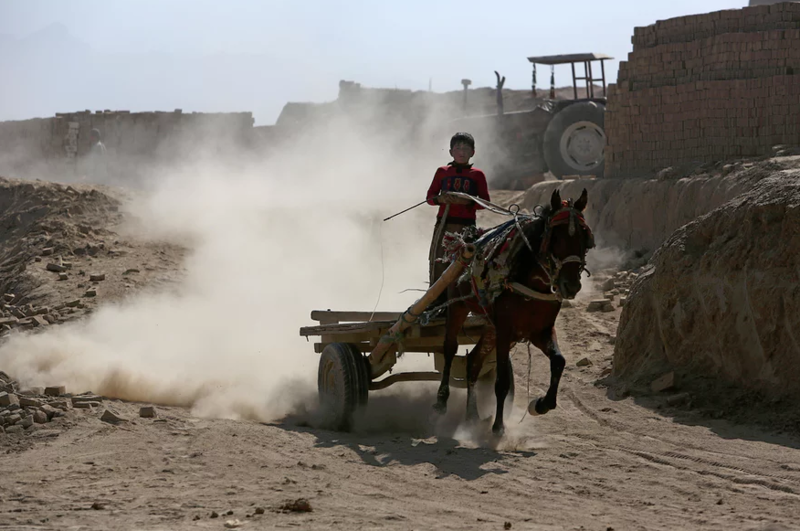 Photojournalism, like that covering Kashmir, has disgraced itself with photos of Afghan sunsets, children hop-scotching, balloon venders.This rare photo from Kabul depicts a young boy working a horse team at a brick factory. The health hazards of brick manufacturing make it completely unsuitable & extremely dangerous for this child who will most likely die at a young age from respiratory disorders & exposure to toxic fumes & dust. This is the quality of life for children under US occupation. Those who defend this war as a way to emancipate women should hang their heads in shame because to most women, the lives of their children are more important than what the hell they wear. US out of Afghanistan. US out of Pakistan. If you grow up facing prejudices of any kind for who you are, you grow an attitude, not a thick skin. Came across this post from Sept, 2011 where I took umbrage at a TV interview with the actress Julianna Margulies. She said her husband was half-Irish & half-Jewish which meant their kid would know how to think & how to drink. Wrote her saying I was pleased she acknowledged the intellectual contributions of the Irish but didn’t think she ought to disparage Jewish people like that since they’ve made their own considerable contributions to human culture. Never heard back from her. It was just announced that Australian war planes carried out their first airstrikes inside Syria, ostensibly against ISIS, as part of the “US-led coalition.” Who else is in the coalition? How many are flying bombing sorties inside Syria? Is Israel part of the US-led coalition or part of the Russian-Syrian coalition? Or both? At one point, the US State Department claimed there were 66 countries in the anti-ISIS US coalition, most of them without war planes involved. What are they doing & exactly why are they involved? The cease fire reportedly does not cover territory controlled by ISIS. There it’s bombs away. But aren’t there still Syrian civilians living there? In the chaotic conditions of war, how exactly are those territories identified? How can they tell ISIS from the countless other paramilitary groups involved? Obama sends more special forces to Syria: whose side are they on? In April of this year, Obama announced the deployment of “an additional” 250 US special forces to Syria to work with paramilitary groups. He didn’t indicate how many mercenaries the US deployed or how many US soldiers & mercenaries were already there. CBS news just announced Obama was deploying 300 more special forces to Syria & again did not indicate the number of mercenaries deployed. It’s hard to believe the four US airstrikes last night in the Syrian city of Deir ez-Zor were just a military blunder from lack of coordination with the Russian military. The US has the most sophisticated military equipment in the world. It’s possible a blunder was involved when so many countries are flying war planes & have ground troops & paramilitaries in the region, but how many of these blunders before Armageddon begins? The problem with reporting on this incident, from both Assadists & anti-Assadists, is that they draw political conclusions based only on speculations. Most writing about Syria is in fact of a military nature without offering a shred of insight into the political character of what is going on. Tendentious reporting of these military actions takes the place of political analysis. It’s hard to remember a previous US war where military reporting on every incursion dominated the political analyses. You shouldn’t have to be a military strategist to understand the reporting. There is a US-Russian brokered cease fire in place in Syria. Why is the US flying sorties into Syria? Most of the cease fire agreement is secret even from the UN. What kind of dangerous game are the US, Russia, Syria, Israel, Iran & all the rest of them playing with the lives of Syrian civilians? The importance of defending Khurram Parvez against imprisonment solely for being a human rights activist cannot be emphasized enough. It is not that his life is of greater value than the tens of thousands of others disappeared, tortured, incarcerated in Kashmir but that he has played a leading & fearless role in defending all other victims & in exposing & documenting the crimes of the occupation. Signing on to this page is not going to spring him out of the gulag but is part of an expanding campaign to protect him from harm, to demand his immediate & unconditional release so that he can continue to defend other activists in Kashmir. He has used social media to build solidarity with them & we must use it to build solidarity with him. It took a few hours to invite almost everyone on my friend list of 5,000 people & only 370 have responded. Get with the program. A man’s life & human rights work is at stake. This is an edited post from September 18, 2015. The discussion of that post, particularly comments by Peggy Mohan & Indira Krishnamurti Pradhan, added to my understanding. It is about how Israel & India use culture to render their colonial projects legitimacy. 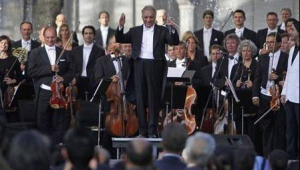 In September 2013, the Indian government & German embassy in India organized a ‘peace concert’ in Srinagar, Kashmir where Zubin Mehta was to conduct the Bavarian State Orchestra–the first concert of its kind in occupied Kashmir. Mehta’s role in this is particularly odious & reprehensible. He is an Indian citizen who lives in the US & is a long-time supporter of Israel. He has been associated with the Israeli Philharmonic Orchestra (IPO) since 1969 as adviser, has been its director since 1977, & was appointed its musical director for life in 1981. He is an outspoken opponent of the cultural boycott of Israel, insisting that music unifies people while he uses the IPO as a public relations tool to promote & legitimize Israel. When he agreed to India’s request to direct a peace concert in Kashmir, whilst India had 700,000 troops deployed there, he cynically claimed he wanted to perform in Kashmir to bring Hindus & Muslims together, as if the conflict were religious. He knew exactly what he was doing to legitimize the Indian military occupation of Kashmir. Kashmiri activists & political organizations (including Khurram Parvez for the Jammu & Kashmir Coalition of Civil Society) called on Mehta to cancel his concert because the event would be used to whitewash & render normality to the Indian occupation & human rights crimes, including thousands of deaths & executions, disappearances, mass rapes, torture & incarcerations. The German ambassador to India replied: “Music is a universal language. Music connects. With the magic power of music, crossing geographical, political & cultural borders, we want to reach the hearts of Kashmiris with a message of hope & encouragement.” The same exact rubbish Israel claims & echoed by Mehta. In unintentional irony, India had to set up more checkpoints & beef up security forces to hold a peace concert that was protested by Kashmiri activists. 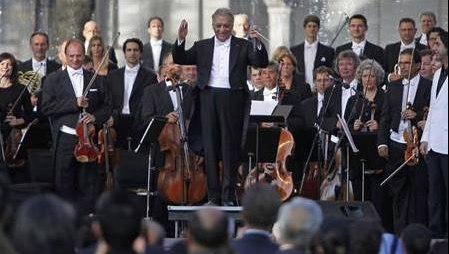 Photo is Mehta with the Bavarian State Orchestra at the Srinagar concert.